The Council for Scientific and Industrial Research’s (CSIR’s) passive radar system has been rolled out to five different sites in the North-Eastern part of South Africa as testing and refinement of the system progresses. One site is on the roof of the CSIR’s buildings in Pretoria, another is at the University of the North West (Potchefstroom campus), a third at Emalahleni (Tshwane University of Technology campus), one at Hartebeeshoek and another at OR Tambo International Airport. The CSIR has been collating data from all these sites over the last few months to provide a comprehensive picture of South Africa’s airspace around OR Tambo International Airport, with data being fed from the sites to a central node located at the CSIR. It has also been adding target reference data from the Air Traffic Navigation Services (ATNS) company to allow for a direct comparison between the performance of primary and secondary radars at OR Tambo and the passive radar. This enables derivation of the relative detection probability and accuracy of the passive radar and also allows for the identification of false alarms. In the area close to OR Tambo, passive radar detection and tracking results shows it within 100 m of the reference tracks obtained from ATNS. The node at the CSIR has been running for over two years and the node at the South African National Space Agency (SANSA) at Hartebeeshoek some one and a half years. Passive radar data from the OR Tambo site has been logged for about five months. The passive radar system can detect large airliners out to a range of some 200 km from the passive radar receiver, but has been tested successfully in detecting fast-manoeuvring fighter jet sized targets at 60 km. Passive radar is much cheaper than active radar, as it has no moving parts and only requires receiving antennas, receiver hardware and a personal computer – a single node could cost around a few hundred thousand Rand, versus millions of Rand for a traditional radar system. The CSIR has collaborated with local companies on passive radar including Peralex and Lochtron, as well as academic institutions (the University of Pretoria and University of Cape Town). Armscor also continue to provide funding support for passive radar research and development. Passive radar is a rapidly progressing technology as the number of useable emissions increase and the cost of computer processing power decreases. Some European countries are even looking at replacing their active air traffic radars with passive radar systems as part of the programme called Single European Sky Air Traffic Monitoring Research (SESAR). 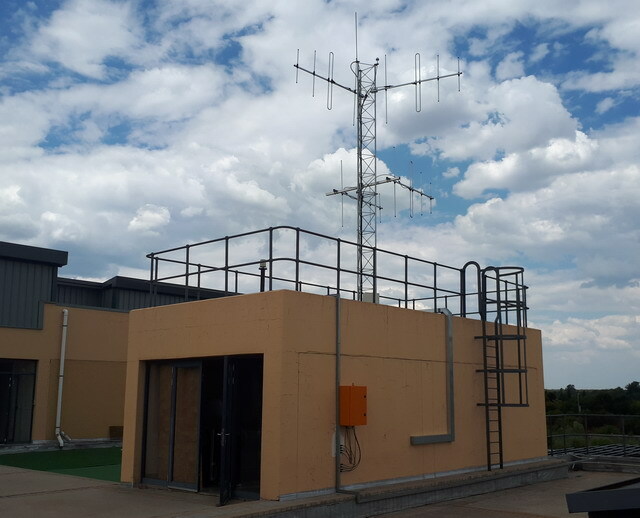 The experiment with passive radar at OR Tambo International Airport is one of the first in the world where a passive radar air-picture is being fed back to civil air traffic control for evaluation. It must be noted however, that passive radar is not currently certified for air traffic control use, and as such, it cannot, at present, be used to direct air traffic. The CSIR is looking at multiple applications for passive radar, including air traffic control (pending certification), border security and unmanned aerial vehicle (UAV) detection around airports. It has even tested passive radar at the coast and discovered that it can detect surface vessels like harbour patrol boats – small boats were detected at ranges of 4-5 kilometres during tests carried out in 2014 in the Western Cape. Tests at the CSIR have also seen the system detecting road traffic. Passive radar prototypes have been built and tested in South Africa since 2013. In the Western Cape, passive radar receivers were able to detect large airliners at ranges of 250 km and also detect and track a turbo prop Dakota transport aircraft. A test in Gauteng in 2013 was able to detect a Cessna 172 aircraft flying at 2 000 feet above ground level at a range of 80 km and accurately predict the rotation speed of the aircraft’s propeller. These tests were done by using FM radio transmissions as the illuminator of opportunity. Unlike traditional radar, passive radar only needs a receiver to detect reflections of targets of interest from signals emitted by other sources, such as FM radio broadcast towers, TV transmitters, WiFi and weather radar. This makes passive radar (also known as passive coherent location, passive bistatic radar, piggyback radar and covert radar) cost effective, safe (no emissions) and highly mobile. By using several receiver sites one can use multilateration to identify the location of an aircraft, or by using a single receiver one can measure the angle of arrival of the reflected signal to determine a target’s location. One of the benefits of passive radar is that it is covert, as it does not have a transmitter subsystem onsite that can be detected and destroyed by negative forces. Transmitters more often than not, consist of public broadcast infrastructure and are therefore clandestine as radar transmitters. Furthermore, it is possible to detect stealth aircraft using passive radar due to the bistatic nature of the radar (transmit and receive functionality are geographically separated) as well as the lower operating frequencies of passive radar illuminators – which renders the radio absorbent material of stealth aircraft ineffective.